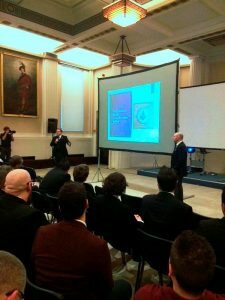 After a trip up early from Sussex the Founders of The Holywell Club arrived at Freemasons Hall for the first Conference of its kind in the UK opened by the chairman of the Connaught Club and a video from its Patron R W Bro Russell Race DL, MetGM. 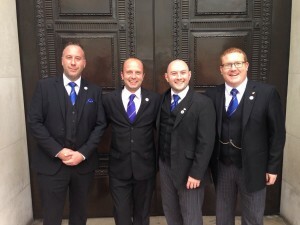 The Club founder’s, WBro Chris Field, WBro James Hopkins, WBro Nick Turner and Bro Steven Donoghue, were invited by the chairman of The Connaught Club to give a fifteen minute presentation on Holywell Club and what we have learnt and achieved so far. The presentation went really well and was prepared by James Hopkins & Chris Field using PowerPoint software and consisted of ten slides explaining how the club started, what we have done and how we have learnt from our most successful events and our not so successful events. The other Provinces that were represented were Southampton Light Blues Club, Buckinghamshire, Metropolitan Grand Lodge, Fleet House Light Blues Club from Hertfordshire, Colonnade Club from South Wales and Holywell Club from Sussex. Each Provincial magazine has a page or article on the Clubs on a regular basis to help boost the clubs and open up new chapters of the clubs in the Provinces. We discussed the concept with a few senior brethren at the Conference, one being an Assistant PGM, about a province having more than one club that operated in the province. The response was that this had been tried and failed and the only way to move forward was to have one club for the entire Province but with different ‘Chapters’ in say Brighton or Chichester and maybe Rye. The event was followed by a small drinks reception and the Installation meeting of Burgoyne Lodge 902 in Temple Room 10 at UGLE. It was a brilliant meeting attended by many young masons and also the Assistant MetGM who gave the address to the brethren. This is just a brief overview of the event and the next Conference will be held in Bath on 1st October 2016 organised by The Adair Club and Holywell have been invited. We, The Holywell Club, have also put our hat in the ring, so to speak, to host the 2017 Conference here in Sussex.